I’ve been digging around since I started this blog, trying to find out who this Breitling DB is, but up until this week I didn’t get anywhere. Then the other day I finally hit paydirt. 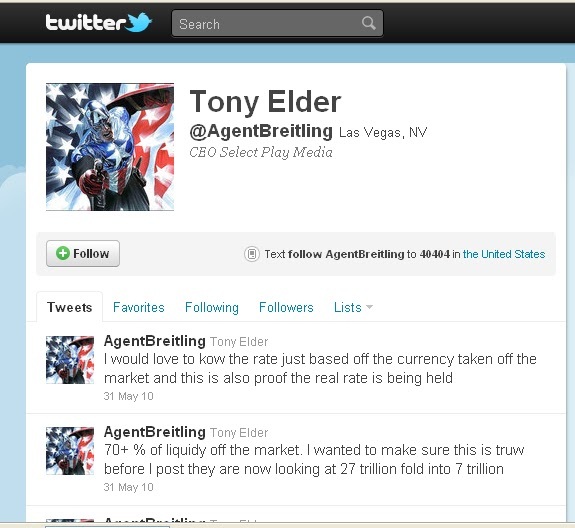 Tony “Breitling” Elder has been pumping for Roger Dorman at Dinar Daddy for some time although it wasn’t clear that he was pumping for Roger because he was pumping The Currency Vault which later became known as The Treasury Vault which is owned by Angela Dorman who is married to Roger Dorman which is kind of like Bill Clinton campaigning for Hillary because he wants to get back in the White House only the Clintons make it clear that they’re related but the Dormans don’t. (I hope you’re taking notes because this WILL BE on the test!) Tony lives in Las Vegas but is from Lake Havasu City, Arizona. Do a search on Lake Havasu City and dinar and you’ll see that a lot of dinar is sold on ebay from there. Hmmmm …. Anyway, Breitling has been pumping the lower denoms for some time now, and it’s no coincidence that lower denom sales have increased exponentially this year, at a considerable markup I might add. I think a lot of people are familiar with Breitling pumping the lower denoms but they might not be as aware of his recent pumping of the ISX report. The ISX is the Iraqi Stock Exchange, and the ISX report gives investors valuable information on how to get set up with an account to invest on the ISX. Now of course there’s nothing wrong with making this information available to the public, and there’s nothing wrong with making a profit. But the way that you do it should be ethical, and the way that Tony and Roger have gone about this is anything but. First of all, all of this information is readily available for free on the internet at www.iraqstockx.com and www.isxwatch.com. No need to pay $49.95 to these guys. Okay, that’s not so bad. I mean if we start hanging everybody who has sold something that was available for free on the internet there wouldn’t be enough left to bury the dead, right? But here’s the really bad part. Roger says of the ISX Report “The guys at The ISX Report have put together the most amazing report about the Country of Iraq and more specifically the Iraqi Stock Exchange (ISX).” And who are the guys at the ISX Report, Rog? Could it be you and Tony “Breitling” Elder? Just like you guys compiled this report from what others had written, you could have easily compiled the ISX report from what was already posted on the internet. That would explain why Tony’s company “Select Play Media” (the name he uses on his YouTube page) is mentioned on the PayPal page for the ISX Report when you order it. 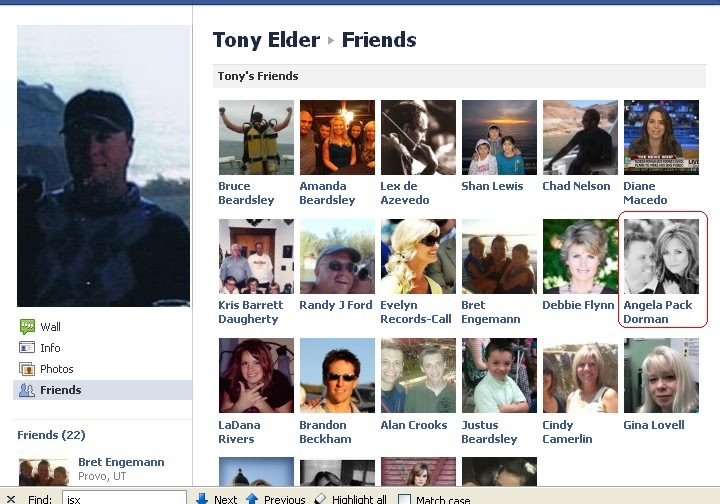 When I discovered Tony “Breitling” Elder’s Facebook page he stated that he was CEO of Gameroxx Entertainment. The address for Gameroxx on Manta shows Lake Havasu City, AZ. The principal is lested as Ted Elder who I believe is Tony’s dad. In searching through the results for Gameroxx in Google I found this page. If you watch the video it displays the following URL. In The Breitling Catalog I mentioned that B talked about how he used to write PPMs, or Private Placement Memorandums to raise venture capital. No big surprise then that a PPM company is showing on a site for Gameroxx, huh? But what is interesting is that the email on that contact page can also be found on a couple of ISX Report sites. I did a WhoIs search for ISX Report’s domain name and as I expected it has a private listing. But being the curious bugger that I am I decided to snoop around on their website and I discovered that their web design company is The Active Media. I did a search in WhoIs and wouldn’t you know it? Their registrant is located in Bullhead City, Arizona about an hour away from Lake Havasu City. Better yet, their Facebook page lists them in …. you guessed it .. Lake Havasu City. Both Breitling and Roger Dorman have talked about this great report compiled by “the guys at the ISX Report”. B has even stated that Jeff got mad at him because he told people not to buy until it goes on sale. It just so happens that the guy who owns The Active Media is named Jeff. Very interesting. It would appear from the above links that Gameroxx, The ISX Report, and DigitalPPM are all connected so exactly who are “these guys”? If Tony didn’t compile this report then he’s business partners with the people who did. Business ethics requires what we call “full disclosure” which means that if you have a business interest in something then you let people know that up front, like when ABC News discloses that they’re owned by Disney every time they do a story on Disney. Pretending to just mention a product that somebody else is producing and profiting from when it’s really your product and your profit is a sleazy douchebag business tactic. It’s the same thing Roger Dorman did when he introduced Angela from The Currency Vault and “interviewed” her about their business without telling his listening audience that Angela’s last name is Dorman too. (What a coincidence, huh?) But enough about Roger Dorman. Let’s get back to Breitling. Now I know that a lot of you out there are saying “I like Breitling. He doesn’t give bogus rates and dates like Okie and TerryK. And he explains this investment to me in a reasonable way.” Exactly. That’s his hook. Just like Adam Montana built the largest dinar forum on the net by capitalizing on the disgruntled investors who got tired of being played by the pumpers only to pump his own products, Tony “Breitling” Elder also figured out that people would get tired of the rate and date game and there was a market for “real” information. And now he’s cashing in bigtime. Only not all of the information he gives you is real. In his 10/6/2011 afternoon YouTube video he said that you could buy the IQD with one or two zeros and put them into a Warka account and that would protect you against a lop. Really B? Really? Do you not understand that a lop is a redenomination wherein all of the bills will be replaced and all of the electronic currency will reflect that? Also, according to Breitling they have removed 70% of the large bills from circulation in Iraq. First of all that makes no sense. How could they function? It would be like removing all of our currency except for the coins. You’d have to load up bags full of coins every time you go to the grocery store. (Remember, Iraqis don’t use electronic banking like we do. Their society is cash oriented.) And secondly, just ask anybody in Iraq if the larger denoms are rare. They’ll tell you that they’re everywhere, and that the people of Iraq depend on them for their daily transactions. Another piece of really bad information from Breitling is that the average Iraqi is living off of 2 dinar a day. That translates to less than 1/5 of a penny. Does that make sense? Well it shouldn’t. According to Aswat al-Iraq the average Iraqi’s income is closer to $2300 (about 2.7 million dinar) a year or $6 (7020 dinar) a day, so Mr. B was only off by 7018 dinar a day or $2225 a year. In researching Tony Elder I came upon this post on www.scam.com. It seems he was involved in some internet startup venture that is now defunct, but caught the eyes of scam watchers. While this doesn’t prove that he’s a scammer, this and his Facebook listing as CEO of GameRoxx Entertainment shed some light on his internet entrepreneurial aspirations which I think adds context to what he’s doing today. In closing I’d like for you to just ask yourselves, “would a guy go to all the trouble to record two YouTube videos a day, run a dinar blog, do God knows how many conference calls and interviews, and spend countless hours ‘researching’ the dinar just to be a nice guy and inform people about their investment?” I think the answer is obvious. Breitling is a pumper. 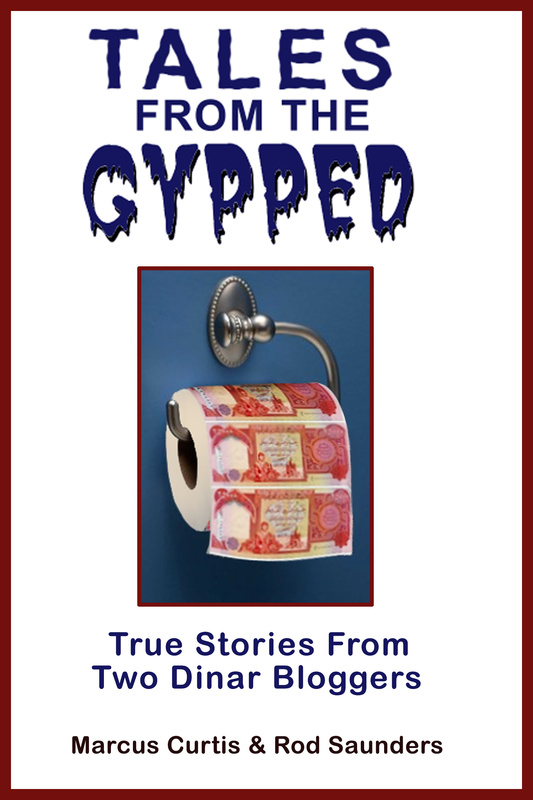 He pumps lower denoms, he pumps the Currency/Treasury Vault and other Dinar Daddy crap, and he pumps the ISX report. He is also known for his usage of the line “while you wait … accumulate” which reminds one of another douchebag named Johnny Cochran who, in defending O.J. Simpson said “If it doesn’t fit you must acquit”. (Douchebags love to make rhymes. Remember when Vanilla Ice said “drop the zero and get with the hero” or when Jesse Jackson said “down with dope, up with hope”?) The smoking gun for me is when I saw Angela (alongside of Roger) Dorman from the Treasury Vault listed as one of his friends on Facebook. He’s in bed with Roger on plenty, and they’re both raking it in at the investors’ expense.